Despite Guild Wars 2, Wildstar, and its own efforts to split its playerbase into have-mounts and have-mount-nots, Star Wars: The Old Republic remains one of the best PC MMOs around. That’s reflected in the findings of SuperData Research, who report that SWTOR made $165m last year. They say BioWare’s first MMO accounts for 8% of the market for MMOs with subscription options. 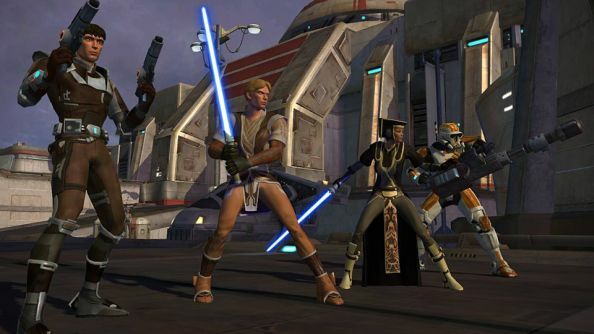 The Old Republic is the fourth most profitable subscription-based MMO in the world, according to SuperData’s report. That puts it behind only World of Warcraft (36% of the market), Lineage (9%) and TERA (8%). The chart’s a little iffy, though, as it’s hardly a like-for-like comparison. While WoW feeds primarily off its monthly subscription, SWTOR runs on an unholy hybrid model. BioWare grant non-subscribers access to all of the game’s class plotlines, but artificially limit everything from XP to the UI in the hope of making paying customers of them. That $165m does mean SWTOR made more than both Lords of the Rings Online and Eve Online last year, however – which garnered $104m and $93m respectively. Elsewhere, The Elder Scrolls Online apparently has more than 750,000 subscribers. SuperData say the subscription MMO market has shrunk from 30.6 million active subscribers in 2010 to 23.4m this year. By contrast, the percentage revenue generated in subscription MMOs via microtransactions has nearly doubled in the last five years, from 14% to 27%. That’s in keeping with what we heard in January: The Old Republic subscriptions declined as its free-to-play success took hold. In March 2013, BioWare said The Old Republic’s free-to-play option was bringing in thousands of new players “every single day”.